"Downside" was a large red brick house in extensive grounds stretching from East Brighton Golf Clubhouse to the beginning of Roedean Crescent, with its South boundary on Roedean Road and its North boundary adjoining the golf course. 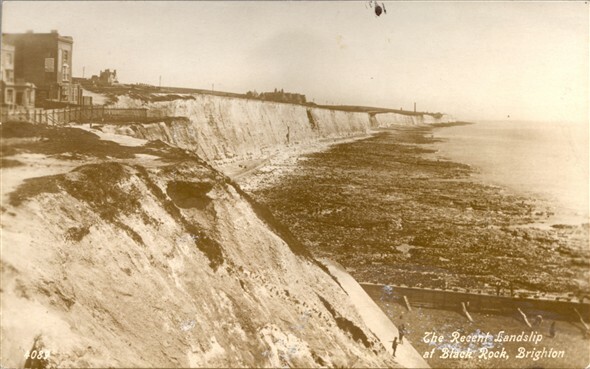 Apart from Lady Sackville's large white house at the east end of The Cliff, it was probably one of the most prominent houses, in its elevated position, before the building of Roedean Crescent. The owner, who was believed to own racing greyhounds all incorporating the name Downside, valued his privacy. His grounds were surrounded by an enormously high hedge with a tall wooden gate to the south, leading on to the Roedean Road public footpath on the top of the grass bank from Roedean Crescent to the Golf Club Drive. Over the years the Downside hedge has been allowed to overgrow this footpath leaving pedestrians no alternative but to negotiate the very busy and dangerous Roedean Road. Because of its seclusion, the only distant view of Downside was from the entrance of the sweeping, rising drive from the bottom of Roedean Crescent. The first houses to be built in Roedean Crescent were three white Spanish-style properties at the West end, two with green roofs and one in between with a red roof. The first green roofed house belonged to the Secretary of the Golf Club who had a back gate on to the Course. However, he would not permit the owners of the red roof house who were members of the Gold Club and very keen golfers, to have the same facility so they arranged for a style to be incorporated into their white back wall for access to the fairway. The owner of Downside purchased the plot nearest to his property to prevent being overlooked. This plot remained unoccupied until the sale of Downside to Dr. Beynon of 24 Eaton Place, Brighton. Is this "Downside", between the Tea rooms at Black Rock and Roedean school? This page was added on 20/01/2008. Very interesting and virtually the only record of early houses in Roedean, at least which I have come across so far. It seems, from maps dating from early at the turn of the last century, that 'Downside' was the property on high ground with an extensive garden located due east of the golf club. Do you know, Pam, which particular property occupies the site today? PS. The house in the middle distance in the picture is clearly White Lodge.